Following a 10-day assessment of Ireland’s rescue package, the European Central Bank, European Commission and International Monetary Fund remain upbeat on the economy’s future. IN GIVING ITS positive assessment of Ireland’s bailout programme today, the troika warned that Ireland still faces many challenges ahead. Following 10 days of assessment, officials from the European Commission, European Central Bank and International Monetary Fund said they expect the fiscal deficit limit of 10.5 per cent of GDP in 2011 to be met. European Commission Director of Economic and Financial Affairs, Istvan Szekely said, “In a nutshell, the programme is succeeding but the country is not yet out of the woods. There are challenges ahead, including getting people back to work and protecting the vulnerable. In his opening statement, the EC official said programme implementation continues to be strong. The authorities have completed the key initial phase of the comprehensive financial sector reforms launched in March. The fiscal deficit limit of 10.5 per cent of GDP in 2011 is expected to be met and important structural reforms are being put in place. These strong policy efforts have underpinned the decline in Irish sovereign spreads in recent months, together with improved EU financing terms. Economic growth has been stronger than expected and the recapitalisation of the banking sector has been completed at a lower than expected cost to the budget, he said. The IMF’s Ajai Chopra later added that there are a number of difficult steps to be taken on the banking front, as well as on the fiscal side. Following comments from Finance Minister Michael Noonan earlier, the EC official confirmed that “substantive” discussions took place between the Irish government and the troika about the upcoming budget. “We talked about possible measures and saw menus of what could be done. We were looking to see if the measures are of high quality and fit into the overall goals of the programme,” added Szekely. 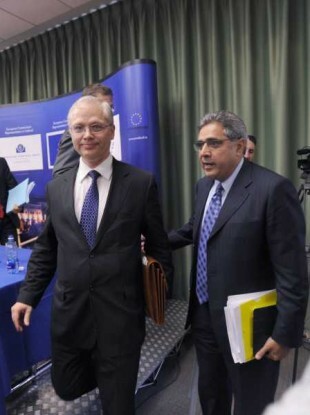 The EC, ECB and IMF are on hand for advice on international best practice and to agree that the fiscal targets can be safely reached, said Szekely and Chopra. On the Croke Park Agreement, Szekely said that it is in the troika’s interest to make sure the budget adjustment is widely distributed in the budget. Asked about the current situation in Greece and possible haircuts on bailout loans, Chopra said the focus needs to be on Ireland and reducing “uncertainty” here. Szekely also said that there are shared views on important parameters in the rescue programme. Earlier today, Noonan committed to reaching the 8.6 per cent of GDP deficit target this year. To do so, there will be at least a €3.6 billion adjustment needed in the upcoming budget. The next review mission is scheduled for January 2012. Email “Troika: Irish programme is succeeding but challenges ahead”. Feedback on “Troika: Irish programme is succeeding but challenges ahead”.